Varian has announced that 10 patients at the Chi Mei Medical Center with brain lesions have become the first in Taiwan to be treated using the company's HyperArc™ High Definition Radiotherapy (HDRT), a new type of radiosurgery treatment solution. 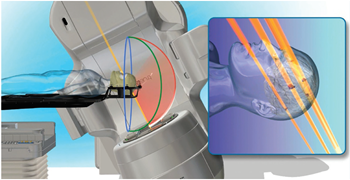 The HyperArc solution is designed to automate and simplify sophisticated treatments such as stereotactic radiosurgery (SRS), and capitalizes on the unique capabilities of Varian's TrueBeam® and EDGE™ treatment systems. HyperArc treatments allow clinicians the ability to deliver more compact radiation doses that closely conform to the size, shape, and location of tumors while sparing more surrounding healthy tissue. These advanced treatments can be delivered in a conventional treatment time slot. The treatment planning for the HyperArc solution is supported by Varian's Eclipse™treatment planning software and ARIA® oncology information system. First patients in Taiwan treated with Varian HyperArc radiosurgery system. Appl Rad Oncol.